We Had an Informational Lunch! Today we had a pizza (and cookie/cupcake/chocolate/soda) lunch for 8th Grade students interested in joining the yearbook (Medallion) and the literary magazine (The Glass Knife) when they return to school next year as Country Day Freshmen. Students not only got their fill of carbohydrates and sugar, but learned a lot about a couple of our beloved school publications. Jaspreet, Zomonster B., Jacob, and Jenny all shared their experiences with these publications, answered some great questions, and hopefully convinced a few (or all!) of the 8th Grade folks to partake in the litmag and yearbook fun for the 2015-2016 school year. As the 2014-2015 school year comes to an end (seriously, where did time go?! 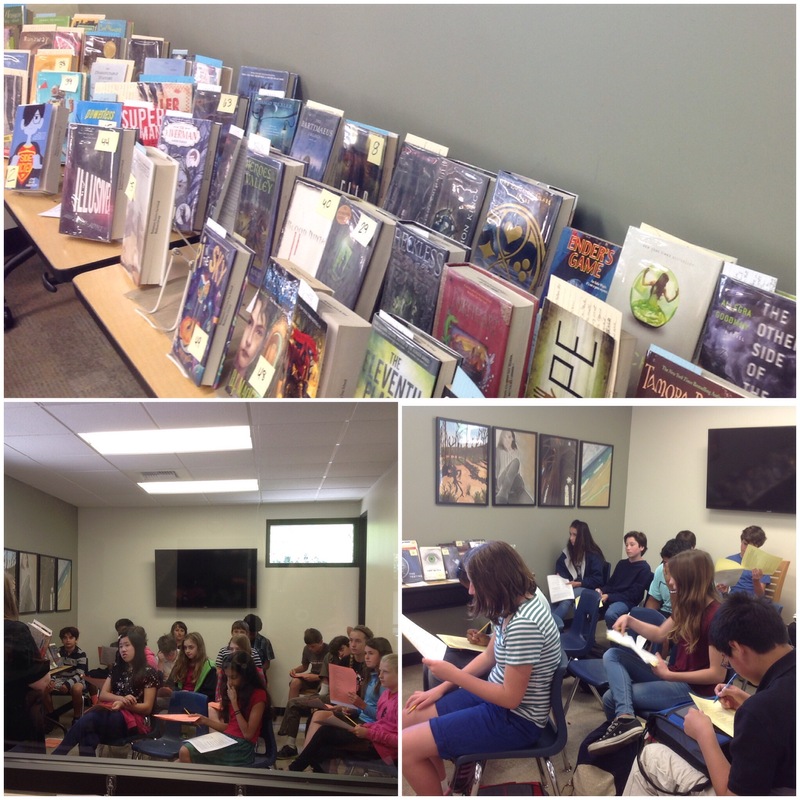 ), we’re getting ready to check in the last books and send everyone home (well, Middle Schoolers!) with their required Summer Reading lists. Click here to see the 2015 Summer Reading Lists! Last Book Club Before Summer! Today we sent out the school year in style with our final book club. There were many lively discussions as the brownies and iced tea were passed around—primarily discussions about strong female characters in literature. Avi brought up one of the protagonists in the new Mad Max film as a strong female character; Shriya mentioned the Warrior Princess novel having strong lady companions, and Anny said that Alli Carter often writes very strong female characters as well. This led Mrs. Nellis to pose the question: was everyone raised to believe that girls and boys were equal? The responses varied; some mentioned cousins getting married at 16 or having arranged marriages; some talked about parents struggling with having strong, independent daughters; some had boldly feminist parents; and some parents even used Law and Order: SVU to teach their daughters that they never had to stay in abusive relationships like the ones depicted on the show. As for the books, Ms. Melinson said she was planning to read some of the Alex Awards books over summer, and others were excited to read books like Game of Thrones and the Mortal Instruments series. For a complete list of titles recommended during this (and all previous!) book clubs, check out our GoodReads list here. 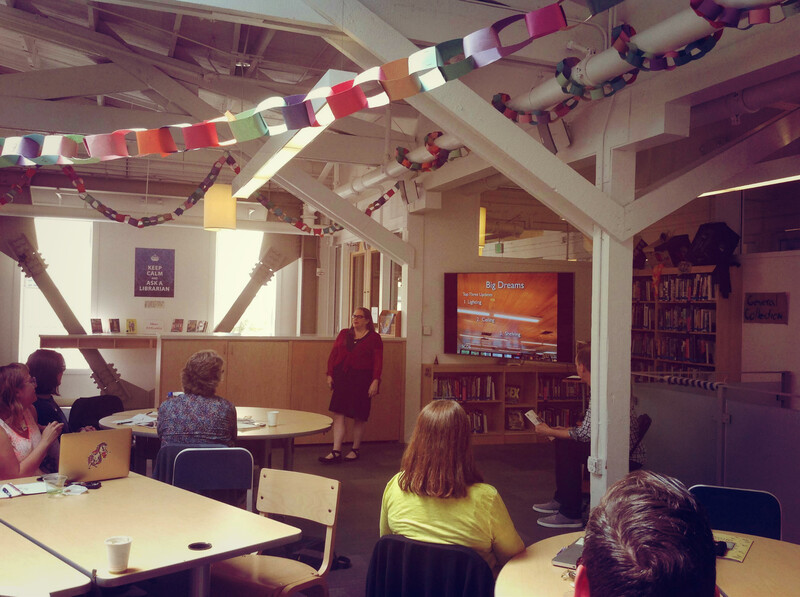 Earlier this week we were delighted to attend a BAISL (Bay Area Independent School Librarians) meeting, hosted at the San Francisco Friends School. Ms. Melinson gave a presentation with Jason Stone (Learning Commons Coordinator at SF Friends School). The topic was all about planning/designing a new library space. And there was candy! We decided to share the presentation photos, as well as other photos from the remodel of the library here.